”Mariachi’s in Panama I hear you say? 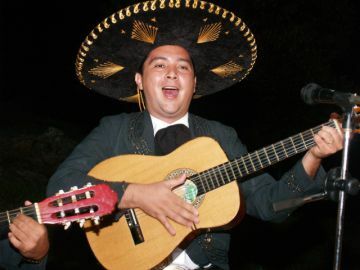 “Wait a minute aren’t they supposed to exclusively Mexican?” Mariachi’s are no more exclusive in Latin America than chili sauce, burrito’s or tequila. My first encounter with a Panamanian Mariachi band was at a function on the 4th of November held at the Guaimi restaurant in Volcano. The Guaimi sits on a small hill to the west of town and affords a stunning view across the town and up to the Baru Volcano. This was made more romantic by the fact that we were enjoying a full moon. 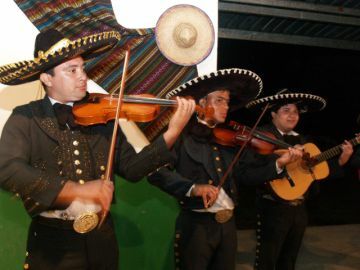 The word “Mariachi” is a derivation of the French for “Marriages Players.” because during Emperor Maximillian’s reign over Mexico the bands were a firm favourite with the troops. The main time they were seen was when playing at weddings, so from that we have the term “Mariachi.” (a little bit of history for you). I thought this band called Mariachi Cielo Bugabeño was just a small musical oddity, but I was wrong, the band’s leader-José Gabriel Solórzano Pinzón, says there are ten such bands in Panama, and five in the Bugaba area alone. The band numbers seven musicians in all-three guitars, two trumpets, a violin and one of those big, wonderful, Mexican bass guitars. 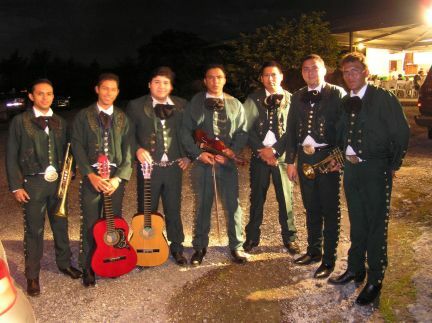 The band was attired in matching green uniforms and all bedecked with the mandatory, sombrero. 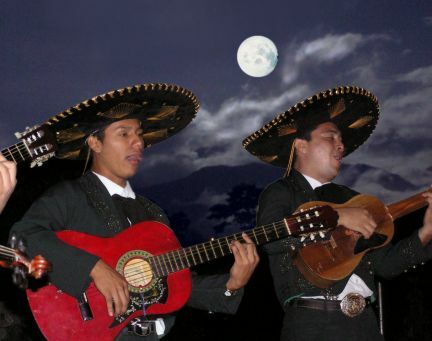 The organizers of this musical soiree, did a great job of giving the night a true Mexican flavour – when you entered the gate and presented your tickets they in turn presented you with a shot of neat tequila. With lots more shots of tequila and quite a few burritos (or was that the other way around? )The evening was a great success. Mariachi Cielo Bugabeño, which roughly means: “Mariachi, skies or heaven of Bugaba,” started off the night with that old classic: “Guadalajara.” I must admit the vocal and musical qualities of this band were as good, if not better than the bands I had heard in Mexico. That great foot stomper “Rancho Grande” followed. The band did come with a humongous sound system that filled the back of a semi-trailer, but strangely they only had two microphones. Being an ex-sound engineer I would have loved to have put mike’s in front of the bass guitar and some on the violins. This would have made the sound balance even better. Ok, I am being picky but the problem with totally acoustic Mariachi’s is that the trumpets always tend to overpower the rest of the band. I was disappointed to hear that they haven’t, as yet, released a CD of their music. José says obtaining copyright clearance for the music is the main reason, that has not happened. I did point out to José that most of the Mexican classics must now be in the public domain, so copyright shouldn’t be a problem. So if you were thinking of relocating to Mexico instead of Panama because the music was better – think again. In Panama we have imported the very best of Latin American culture – and oh yes that does include José Cuervo Tequila. The moonlit, magical mountains of Volcan.